Helps to reduce stem borer pest intensity. Easy to handle and save the time. Useful to extract cashew apple juice from ripe cashew apples for preparation of ready to serve, sharbats, nectar etc. Efficient in destruction of weedsSave labour and time. Capacity to harvest 141, 333 and 46.06 kg/day of cashewnut, mango kokum respectively. Automatic lifting mechanism and provision of bucket to stand operator and to keep fruits. Easy movement up to 1800 to both sides of tractor, at a time four trees are covered. Maximum lifting height 12 m.
The time required to cover one has was 7 h.
Pedal operated arecanut dehusker was developed based on ergonomical and mechanical considerations. Dehusking mechanism having rubber beaters was developed for dehusing of dried arecanut fruits. It was operated by pedal using bicycle mechanism. The machine dimensions such as hopper height, saddle height, handle diameter and length etc. were designed using the relevant anthropometric data/ The peripheral speed of dehusking drum was optimized as 7 m/s with 15 kg/ha feed rate. The pedaling rate was optimized as 60 rpm with power requirement as 75 W. The developed prototype of pedal operated arecanut dehusking was ergonomically and mechanically evaluated. The mean working heart rate, oxygen consumption rate and energy expenditure rate were 127 (± 8.4) beats/min, 1.3 (± 0.1) lit/min and 27 (± 2.79) kJ/min, respectively. The average dehusking efficiency and kernel breakage for pedal operated arecanut dehusker at 7 m/s peripheral speed and 15 kg/ha feed rate were 96.6 per cent and 6.9 per cent, respectively. The dehusking cost of arecanut by pedal operated dehusker was 27.5 per cent less as compared to traditional method. Power operated dehusker was developed for increasing the dehusking capacity and reducing drudgery. 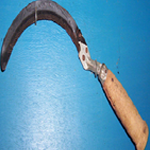 Dehusking mechanism having rubber beaters was developed for dehusking of dried arecanut fruits. One horse power single phase electric motor was used as power source. Belt pulley type power transmission was used. A simple hopper with flutted wheel type metering mechanism having two fruits was developed. The space of each flute is sufficient to accommodate 2 to 3 arecanut fruits. The capacity of hopper was sufficient to store 8 to 10 kg of arecanut dried fruits. The feeding rate of dried arecanut from 30 kg/ha to 15 kg/h could be altered by just closing and opening of flutes. In case of power operated arecanut dehusker, average dehusking efficiency and kernel breakage ast 7 m/s peripheral speed and 20 kg/h feed rate were 98.1 per cent and 9.9 per cent, respectively. The dehusking capacity for power operated dehusker was 13 kg/h, which was 3.6 times more than that of by traditional method. Dehusking cost of arecanut with traditional method and power operated dehusker was Rs. 5.1/kg and Rs. 1.9/kg, respectively. The dehusking cost of arecanut by power operated dehusker was 63.5 per cent less as compared to traditional method. It is recommended to use Dr.BSKKV developed foldable coconut dehusker having detachable handle for better performance and easy handling.